Congratulations on your courageous move to dismantle the outdated Soviet-styled “Planning Commission of India” and replace it with the new body “Team India” to decentralize planning and development of India. As you embark on this task, please consider the progressive concept of district-level autonomy for both governance and economic development. After all people live and experience life in cities and districts, and that is where citizens can directly participate in governance and exert control on their economic activities. The concept of Centralized economic planning and development is alien to “democracy” in modern times. Historically, it has failed in every instance. Given India’s political diversity and population mass, State-level controls for all aspects of development do not yield results as has been witnessed sine independence of India over the past six decades. This is evident from the current economic disparity among the States. Decentralization needs to percolate to the district level to have any meaningful impact on India’s stability and prosperity. Mr. Prime Minister, to a common citizen greatness of a country consists in the conveniences of civil life, personal safety, neighborhood cleanliness, reliable health care, quality education, employment opportunities, etc. It does not matter if country has an overall higher Gross Domestic Product (GDP) or strong military force, or impressive foreign policy, or beautiful historic monuments, but it lacks basic attributes of personal happiness and safety. Societies where such dichotomies exist need introspection and take corrective measures to improve life of its citizens – essence of a successful democracy. At present, India has an over-centralized administrative and budgetary controls at the National and State government levels. Despite economic reforms of 1991 by Finance Minister Dr. Man Mohan Singh this centralized “top-down” democracy has allowed only a slow paced economic growth in India. The decisions for citizens’ lives are made in the State capitals without the direct control of the citizens. 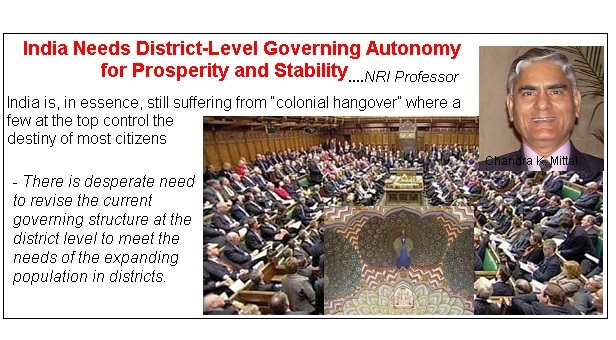 India is, in essence, still suffering from “colonial hangover” where a few at the top control the destiny of most citizens –a typical feudal mindset. India has an average of about 2 Million (20 Lacs) people residing in each district, which either equals or exceeds total population of more than 100 independent countries in the world. These countries are autonomous and are able to successfully provide public safety, education, healthcare, civil infrastructure, etc for their citizens. But in India, city-level administrations with similar population size (or some with even 50-80 Lacs people) are mostly relegated to collecting garbage, cleaning roads, and regulating building permits. And that too they are not able to do satisfactorily because State governments control district administrations. It is a folly to believe that present “centralized” system of India’s governance both at national and state levels can bring India into the modern world since it is inherently non-conducive to economic development and political stability .The solution to modernize India resides in building city/district-level autonomy for integrated development of the districts. There is desperate need to revise the current governing structure at the district level to meet the needs of the expanding population in districts. The civil services under district autonomous control should be supported by public funds from local, state and national sources. Because Indian constitution defines Republic of India as union of States, the statists would argue that too much decentralization of authority and freedom will lead to political destabilization, social unfairness, and even national disintegration. But this is far from the truth. If anything, it is too much State-level autonomy and control that is a risk for national integrity because of political diversity in India. Such tendencies have been witnessed in some parts of India. District-level autonomy would be in fact a blessing for integrity, stability and prosperity of India. In the post Planning Commission era, India has to be innovative in creating conditions conducive to economic development at the district level. The citizens of both rural and urban areas within the districts should be involved in the economic and industrial development planning, policy formation, budgetary planning, execution and control of development of their districts. Local Chamber of Commerce or their equivalent should be encouraged to solicit funds for development, support and help the entrepreneurs unleash their talent and energies under appropriate national and state oversight. This change would not be easy because of the vested political interests in the present governing system. But, strong national leadership and the “will of the people” can overcome such hurdles. As US President John F. Kennedy once said (paraphrased), true leaders do things not because they are easy but because they are hard. And they do it for the larger good of the society. Mr. Prime Minister, the US President Barak Obama recently called you a “Man of Action” based on your dynamism and leadership that you have demonstrated in the short duration since taking office. It is only a leader of your caliber, vision, courage and fortitude who can create a strong, prosperous, and peaceful India in the 21st century and enable it to join the league of progressive nations.